Why Use DHTMLX Gantt Chart in Salesforce Lightning? for building highly efficient cross-browser cross-platform project management applications. We provide you with a steady bridge for implementing our powerful tool in your Salesforce apps. These two frameworks are recognized tools for developing reliable enterprise software for small, medium-sized, and large businesses. While Salesforce offers top-notch ready-made solutions, dhtmlxGantt enriches them with a variety of handy features and complete customization for managing projects efficiently. Our Gantt chart library is easily and, what’s most important, securely assembled with Salesforce Lightning components due to the compliance with the LockerService mechanism. It enables you to create Salesforce project management apps based on Gantt with less effort and at top speed. The whole process of implementing our Gantt chart in your project is accompanied by online technical support of our development team. You are granted with as many support requests as you need and an average response time of up to 24h on business days. In case you don’t have time and resources to integrate Gantt into your Salesforce app on your own, we are always ready to do it for you from scratch. You can rely on our experienced development team to assemble a custom-made Salesforce application with a Gantt chart tailored to your needs. dhtmlxGantt is marked by its robust performance being able to process an immense number of tasks at a time. It gives an advantage of scaling projects up to 10000+ tasks with no harm to the efficiency. Whether you have a small project with 100 tasks or a huge one with tens of thousands of tasks, you will still get a stably working Gantt. 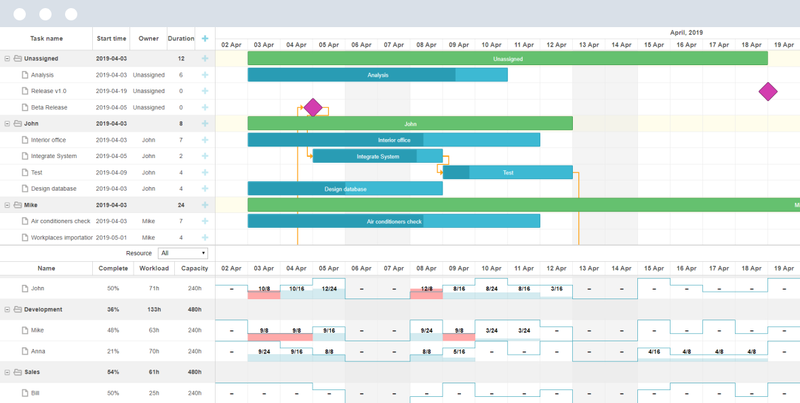 Apart from common features, Gantt has a range of helpful extensions to fine-tune project management apps and cover various use cases and needs. Starting from tooltips, full-screen mode, status line to auto scheduling, smart rendering, and custom content, Gantt opens up plenty of opportunities to achieve the desired look and feel and UX. The highlight of Gantt is resource management functionality, which allows expertly allocating and managing multiple resources. Resource load diagrams and histograms contribute to an accurate workload estimation. This rich feature set is to the advantage of any project like construction works, logistics, product development, etc. By default, Gantt provides 7 skins, including Material-based one, and a range of predefined templates. However, numerous customization options enable you to change any element (tasks, links, tooltips) as well as modify the existing templates of the grid, timeline, lightbox, etc., so that your Gantt chart could be a perfect fit for your Salesforce project management app.